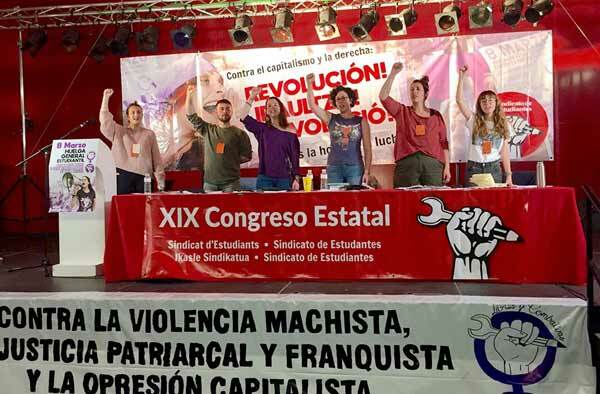 Over the years, International Women’s Day – originally intended to mark the inspirational struggle of the half of the world oppressed because of gender – has been commercialised, stripped of its radical message on women’s key part in the socialist movement. As a contribution towards reclaiming the day and its real significance, Eleanor Donne outlines its origins and relevance today. March 8th is International Women’s Day. These days in most parts of the world this event has lost its political character and is often little more than a glossy promotional event for ‘woman friendly’ businesses and a vague ‘celebration’ of women’s achievements. It is worth reminding ourselves, however, of its roots in the socialist movement of the early 20th century, and the role it played as a focal point for the struggles of working-class women internationally, for better working conditions and pay, and for a political voice. Fifteen thousand women marched through New York City demanding shorter hours, better pay and voting rights. In the US, women garment workers went on strike for better pay and working conditions. In accordance with a declaration by the Socialist Party of America, the first National Woman’s Day was observed across the United States on 28 February. Women continued to celebrate National Women’s Day on the last Sunday of February until 1913. Less than a week later, on 25 March, the tragic ‘Triangle Fire’ in New York City took the lives of more than 140 working women, most of them Italian and Jewish immigrants. This disastrous event drew significant attention to working conditions and labour legislation in the USA and became a focus of subsequent International Women’s Day events. Russian women observed their first International Women’s Day on the last Sunday in February 1913 with illegal meetings. They expanded their campaign in 1914, many facing imprisonment and exile by the tsarist regime. The call for the vote in Russia was seen as an open call for the overthrow of the tsar. The Socialist International disintegrated as most of its constituent parties lined up behind ‘their own’ countries’ ruling classes on the outbreak of war. Clara Zetkin and Rosa Luxemburg, a Polish leader of the German revolutionary movement, used International Women’s Day as a focus for anti-war rallies in 1914 and 1915, in spite of efforts at sabotage by right-wing leaders in the SPD. Luxemburg was assassinated in 1919 along with Karl Liebknecht, with the complicity of the SPD government. In many countries, especially those of the former Soviet Union and Eastern Europe, International Women’s Day is still an official holiday. This is largely because of the significance of that date in February 1917 in sparking the movement that led to the Russian tsar being overthrown (known as the February revolution). Later, as Stalinism took hold and the progressive programme of the early Soviet state on women’s rights was rolled back, International Women’s Day was stripped of its revolutionary character, ending up as something like a cross between Valentine’s day and mother’s day when men honour their wives, girlfriends, work colleagues, etc, with flowers and small gifts! Do we need International Women’s Day today? In the advanced capitalist countries women’s position in society and our rights generally have improved greatly since the first International Women’s Day events in the early 20th century and even since the International Year of Women in 1975. This has led some, even some ex-veterans of the 1970s women’s movement, to argue that women are not specifically oppressed any more. Others have even argued that men have lost rights in favour of women. Perhaps that is why there is now a semi-official International Men’s Day (in November in case you were wondering). However, it is not the case that women, working-class women in particular, have achieved equality, let alone liberation, and in some parts of the world their situation has got worse. In the former Stalinist countries women face increased poverty, violence and sexual exploitation as the economies nose-dived with capitalist restoration, childcare and public services were slashed, jobs disappeared and society fragmented. In the ex-colonial world women make up the majority of the poor, and girls and women often face oppressive laws controlling their sexuality and behaviour. The struggle against women’s oppression, the determination to change society that was the inspiration for the original International Women’s Day is just as vital today. Clara Zetkin, Alexandra Kollontai and others active in the Socialist International in the early 20th century understood that working-class women have the most to gain from getting rid of the system of capitalism and, in spite of the obstacles they face, can be the most determined fighters for socialism. The song, Bread and Roses, by the ‘working women of the west’ (1911/12), is associated in particular with the strike of women immigrant workers at a huge textile mill in Lawrence, Massachusetts, in 1911. With the help of the mass union movement, the Industrial Workers of the World, in particular their full-time organiser, Elizabeth Gurley Flynn, they won most of their demands for increased pay and better working conditions. Hearts starve as well as bodies: Bread and roses! Bread and roses!